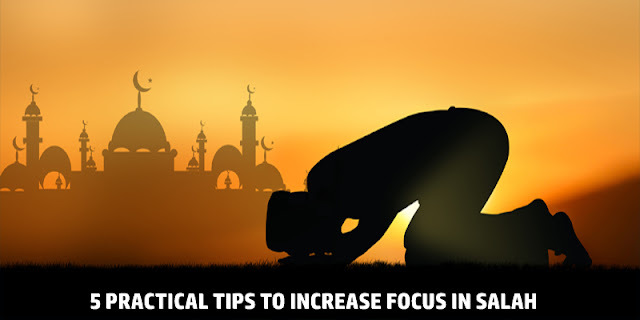 Here Are a Few Practical Tips to Make Your Daily Salah Effective and Get the Full Rewards in Your Lives and Hereafter. Allah (subhanahu wa ta’ala) commands in the glorious Qur’an to seek refuge in Him from Satan. Strive hard to contemplate, ponder and reflect on the meanings of what is being recited in the Salah. For non-Arabs it is highly important and recommended to learn the Qur’anic Arabic. Imagine the greatness of Allah (subhanahu wa ta’ala), focus on the keywords even if you don’t know Arabic. Imagine and feel the happiness of being with the prophets in Jannah when their names are recited. Try to focus completely using all your senses, your heart, your body, your mind. There should not be anything that distracts the person while praying. All the images/adornments/sounds must be removed; especially prohibited sounds such as singing and music must have no place in the salah premises. Wandering whilst praying reduces the rewards. We must avoid both the wandering of the mind as well as physically looking around during the salah. According to another hadith: “Allah is turning towards His slave so long as he does not look around, so when you pray, do not look around.” Narrated by Ahmad (17800); classed as saheeh by al-Albaani inSaheeh al-Jaami‘ (1724). You never know if this one is your last prayer. Giving your best shot in this prayer may get you the ticket to Jannah. The one that you are praying now is the farewell prayer. This thought will help you be concerned about your hereafter and will in sha Allah be helpful in avoiding any distraction whatsoever. Ad-Daylami narrated in Musnad al-Firdaws from Anas (may Allah be pleased with him) that the Prophet (blessings and peace of Allah be upon him) said: “Remember death when you pray, for if a man remembers death when he prays, he will strive to make his prayer good. Pray the prayer of a man who does not think that he will ever pray another prayer, and beware of any matter that may require you to offer an apology.” Classed as hasan by al-Haafiz as it says in al-Maqaasid al-Hasanah (p. 226); classed as hasan by al-Albaani in Saheeh al-Jaami‘ (849). In the end, we pray to Allah (subhanahu wa ta’ala) to help us increase focus in our salah and accept our prayers, Ameen ya Rabb! !